Are you trying to change your BA password and having difficulty doing so? For some suggestions, go to this wikipost. On Thursday 6 September 2018 at about 1830 London time (UTC+1), BA announced that there had been a data breach involving customers using the BA website and the BA mobile app. A further update dated 25 October 2018 can be found in this post 1377. The SPG Law class action thread can be found here. If you believe you may have been affected because you made a booking or paid to change to your booking with a credit or debit card on ba.com or the mobile app between 22:58 BST August 21 2018 until 21:45 BST September 5 2018, we recommend you contact your bank or credit card provider and follow their advice. That is followed by a series of FAQs. These are reproduced at the end of this wikipost. If you are experiencing difficulties in changing your BA password or want further information about doing so, some information is in this thread: https://www.flyertalk.com/forum/brit...rd-ba-com.html (which also has a wikipost). American Express - A recorded message says they are aware of the breach, there is no need to take any further action and if you suffer any financial loss you will be fully compensated; an email says: "There is no action you need to take – we will contact you immediately if there's any unusual activity with your Account. In the meantime you can continue to use your Card as normal" (see post 293, post 401, post 470 and post 491). Barclaycard - They just assured me I was fully protected, and I didn't need to do anything yet (see post 253); however at 18.20 on 7/9/18 the customer service helpline automated message says that affected cards are being reissued (see post 511). Barclays Bank - They have contacted people they believe to have been affected, and have blocked their cards from online use (website/app), but the cards remain valid for physical (chip & PIN) transactions in shops, ATMs etc. New cards being dispatched "within a week" (see post 918). Capital One - online transactions being blocked, new cards being issued (see post 493). HSBC Premier Mastercard - Offering customers the option to freeze the card or replace it with a new card (see post 274). Lloyds - Said "wait and see", but did give the option to cancel the card and have it reissued (see post 403). Lloyds Mastercard - Based on the information they have, fraudulent use of my card is unlikely, just keep an eye on online banking and report anything suspicious (see post 370). Monzo - Automatically replacing all cards (see post 371). Natwest- Of the opinion that as there had been no fraudulent activity on my account to just keep an eye on things, and to call immediately if any suspicious transactions appear and fraud team would refund (post 315). Starling - Automatically replacing cards (see post 460). TSB - Call the Telephone Banking Team on 03459 758758 to discuss further (see post 437). Vanquis - online transactions being blocked, new cards being issued (see post 493). Official emails relating to this theft will be sent from: [email protected] You should hover over the sent email address to confirm this is where the email has been sent from before clicking on it. We will be offering a 12-month credit rating monitoring service to any affected customer who is concerned about an impact to their credit rating, provided by specialists in the field and will share details of this in the near future. We deeply apologise for any worry and inconvenience this criminal activity has caused. For your reassurance, we’re offering you 12 months of free credit and identity monitoring services, provided by Experian, one of the UK’s leading Credit Reference agencies. To help you to monitor your personal information for certain signs of potential identity theft, we are offering you a free 12 month membership to Experian ProtectMyID. This service helps detect possible misuse of your personal data and provides you with identity monitoring support, focussed on the identification and resolution of identity theft. 1. Ensure that you sign up for the service by 12 December 2018. Your code expires after this date. 2. Visit the ProtectMyID website to get started. 3. Click on ‘Join ProtectMyID’ (top right-hand side). This code is unique to you and only available in this email – please keep this email for reference. 1. Unlimited access to your Experian Credit Report. 2. Credit Alerting – an email or text to let you know when certain changes happen on your Experian Credit Report, such as the addition of a new credit search. 3. Access to an Identity Theft Resolution service if you do become a victim of fraud, where you’ll have a dedicated case worker who will support you in resolving fraud that has occurred. 4. If you are at higher risk of fraud, Experian can add protective Cifas registration to your credit report which can help prevent credit being taken in your name. The Cifas Protective Registration service places a flag alongside your name and personal details in the National Fraud Database. Companies and organisations who are signed up as members of the database will see you’re at risk and take extra steps to protect you. If you have any questions regarding this service, then please contact Experian’s Customer Support Centre on 03444 818182*. They are open Monday to Friday, 8am to 8pm and Saturday, 9am to 5pm. 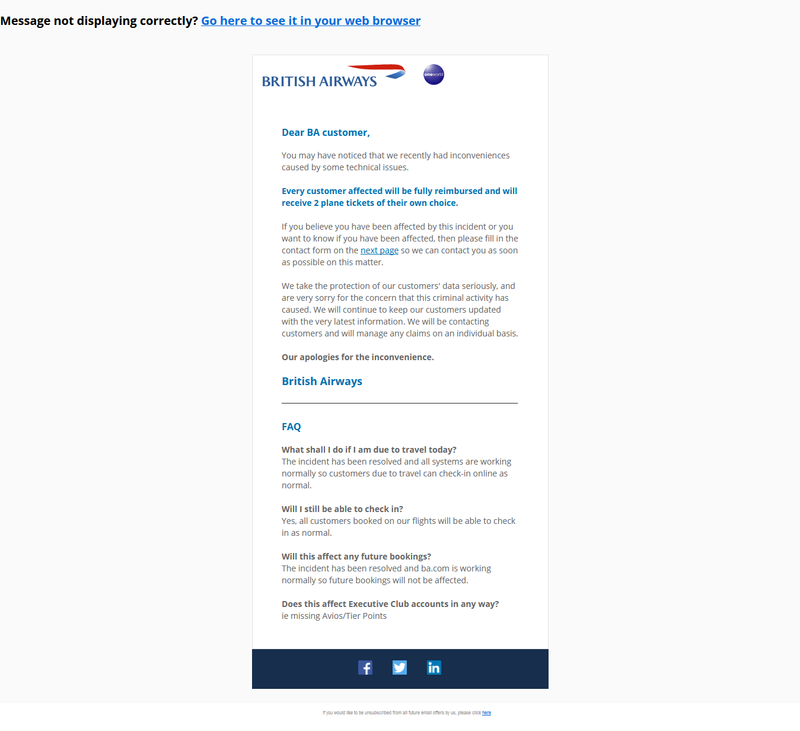 Note that the email from BA gives you a personal "Activation Code". However, when you get to the signup forms for ProtectMyID, you put the code into the second page of the sign up form in the "Promotional Code" field. I think Flip42 meant how could they access the stored card number if the hack method was effectively a keylogger and they could only access things you actually type in; and in the case of a stored card number, you by definition don't have to type the number in again, just the CVC. Thanks, that's what I meant. Perhaps we'll get a more detailed explanation from BA in due course, although I suspect we'll never hear that level of detail. Wound't they be obligated by the GDPR to inform those affected? They haven’t really bothered to properly follow the process so far, so I doubt that as well. bermudasun and Silver Fox like this. Which part of the process do you believe has't been followed? GDPR regulations require an organisation to report a data breach within 72 hours of it being discovered and, in the case of a serious breach, to inform all affected individuals. I think British Airways has done that. Received my first BA themed targeted phishing email, with an offer of 2 free tickets to anywhere as compensation if I just "fill in the following form" that leads me to a fake log in page. adrianlondon and T8191 like this. I would send that to BA to have a look at, particularly if you can include the header data including IP address. Either use a webform or the DPO email address referenced above (post 512) in the second email from Álex Cruz. I seem to recall an old spam email circular along these lines from about a year ago. Ancient Observer and corporate-wage-slave like this. Would you mind sharing a screenshot? I would hope it would be blatantly obvious to everyone it's probably fake (if they also receive it) but it might be good to have a record here too. Phishing Email - looks quite sophisticated! DYKWIA, corporate-wage-slave and T8191 like this. I notice BA have issued today a slightly reworded message about this incident, and I'll put the text here so we have a local record here. Note the reference to Phishing. 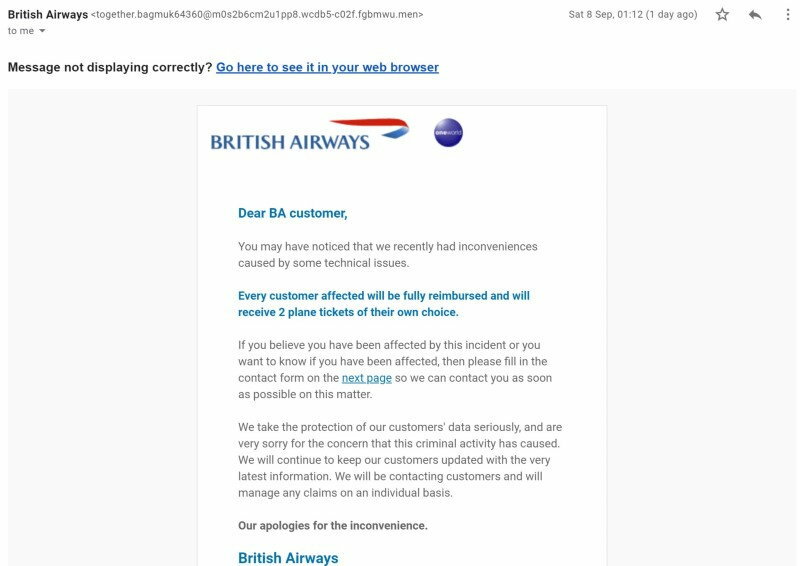 We are investigating, as a matter of urgency, the theft of customer data between 22:58 BST August 21 2018 until 21:45 BST September 5 2018 from our website, ba.com and our mobile app. The breach has been reported to the authorities and our website is now working normally. We advise any customers who believe they may have been affected to contact their banks or credit card providers and follow their advice. British Airways will not be contacting any customers asking for payment card details and any such requests should be reported to the police. We understand that this incident will cause concern and inconvenience. We have contacted all affected customers to say sorry, and we will continue to update them in the coming days. If you believe you have been affected by this incident, then please contact your bank or credit card provider and follow their recommended advice. Please be aware that we are experiencing high call volumes into our contact centres, please continue to check this page for the latest information. Customers should also be aware that fraudsters may be claiming to be British Airways and attempt to gather personal information by deception (known as 'phishing'). See below for more information on how to validate that the email you have received from us is genuine. [Paragraphs conjoined to reduce screen acreage]. Some comments above about whether this was a keylogging hack. As someone else has said, that isn't the case. From what I've read and pieced together, this was a data intercept as the data enters some kind of payment system. It seems most likely that this hack intercepted the data right at the payment system, after any encryption of the transmission had been removed. So, whether you used a stored credit card or typed the details in, makes no difference. Whatever data the payment system needs (BA have said, so far, that it's your name, address, email address, credit card number, expiry date and CVV number) would have been captured. The important thing to note is that only data sent during the timescale mentioned is impacted. For example, say you had three credit cards stored in the BA system and used one of them to buy a ticket on 15th August, and one on 25th. Only the card used on 25th August is impacted. As any fraud will be reimbursed, if it were me and I needed a potentially-impacted credit card to survive my trip/holiday I'd just keep using it and deal with replacing it once I got home. Of course, if fraud is attempted while you're away and your credit card company catches it and blocks your card, THEN start worrying about how to fund the rest of your trip. Friends/family can wire money using Western Union, or use another card, or ask your bank what your options are. In those cases, keep all receipts (cost of phone calls, wire transfers etc etc) and submit a claim from BA once back. T8191 and flyuk like this. Sure. Obviously I've redacted my email address. orbitmic, corporate-wage-slave and Clareym66 like this. From what I've read and pieced together, this was a data intercept as the data enters some kind of payment system. It seems most likely that this hack intercepted the data right at the payment system, after any encryption of the transmission had been removed. This is what I thought based on the information that was released on Thursday. However, with information to a payment system, why would that also make your full name, date of birth and home address vulnerable? And apparently, they are warning both online (web interface) and offline (telephone based) users during that period. Either someone who doesn't fully understand the technical details is writing the communication points, or this has a different texture than we thought. Too early to say this. I have read Article 82 in full but without reading the entire General Data Protection Regulation 2016/679. Article 82 does state "Any person who has suffered material or non-material damage as a result of an infringement of this Regulation shall have the right to receive compensation from the controller or processor for the damage suffered." The "as a result of an infringement of this Regulation" highlighted above would seem to be a crucial condition and I'm not certain that the regulator as yet determined whether or not there has been an infringement of the regulation. I'd imagine it would take several months to make such a determination. Who knows what information their payment system (whatever it is) needs. I assume that telephone bookings are also impacted as whoever took the call ends up at the same payment system. All times are GMT -6. The time now is 8:59 pm.